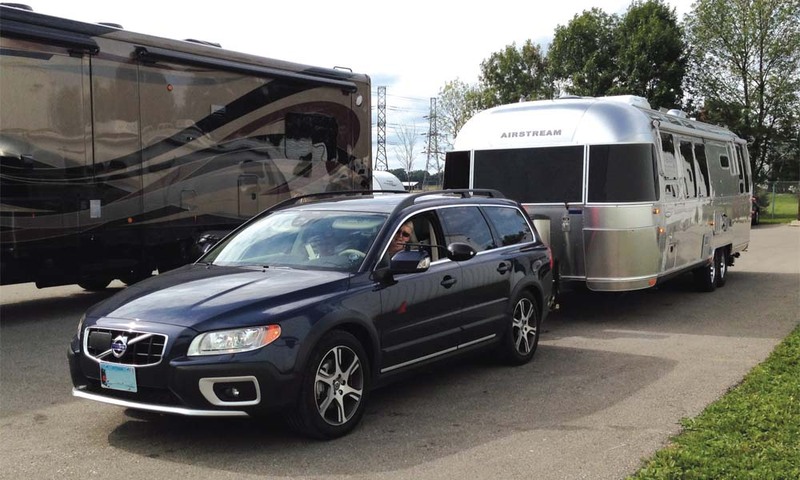 I recently received an e-mail from a reader asking if I had any articles about towing with a Volvo Cross Country, which the company now calls the XC70. Not only did I not have an article on the Cross Country, I did not have any articles on Volvos. This, I realized, was odd since we have more history with Volvos than any other European Car. In fact Volvo was the first compact car we ever put hitches on starting in the early 1970s when we had several customers towing compact Airstreams. During that time, the 2.3 L 4-cylinder only produced about 100 horsepower – but Volvo’s are almost always tuned with an uncanny amount of low-end torque, which still stands true today. While Volvo’s were always solid, safe and durable, they were somewhat utilitarian and not overly quiet or smooth. The new Volvo’s are very quiet, smooth and can be as luxurious as you desire. Something that hasn’t changed from the 1970s is the fact that all Volvo cars have the same 3,300- pound tow rating – every year, every model. This is the rating from Europe and they just bring it across to us. Earlier this year, I had the opportunity to drive a Volvo XC70. A customer from British Columbia ordered a new Airstream. After test driving a variety of SUVs they fell in love with the XC70, which they ordered to arrive about the same time as the Airstream, allowing them to fly in and pick up their entire combination. Since it is always a good idea to put some kilometres on a car before towing, I wound up driving the Volvo for a couple of weeks to break it in. I can say I was very impressed. First of all, what I noticed is the steering is very precise and communicative. It’s very similar to the Jaguar I drive every day. I could toss it into a turn without the top heavy feel of an SUV. It actually handles like a sports sedan but has all-wheel drive and as much ground clearance as most people will ever need. Adding to its quiet feel is its strong body structure, which also helps with handling stability. The base engine on the XC70 is a silky-smooth, 3.2 L inline 6-cylinder with 240 hp and 236 pounds-feet of torque, but you will want to opt for the optional 3.0 L Turbo, which produces 300 hp and 325 pounds of torque from 2100 to 4200 rpm. Solo, this car turns in 0-60 mph in 6.9 seconds. Psychologically this car is a bit confusing – is a very practical Volvo wagon supposed to be a blast to drive? The same properties that make this car handle so well make it a great handling tow vehicle. The combination of ride and handling is just about perfect giving precise control without being jarring. It’s available with a variety of tire sizes. I think the best size for most towing is the P235/50R x 18”. Volvo has a long history with turbocharged engines over the years. We have had many customers use them and never had a problem. Volvo’s are used extensively for towing in Europe and though the trailers are lighter, they have as much air drag as the easier towing North American trailers. Once at highway speeds it works best to put the transmission into manual mode and use the paddle shifters to lock into fifth gear most of the time. In Europe, they do get to order a slick 2.4 Litre five-cylinder diesel, which would be nice but there’s no sign of it for North America. There is one glaring omission on the XC70 and that’s the lack of instrumentation. Volvo’s theory is to have as little as possible to reduce distraction to the driver and let the computer take care of the systems. Still, a temperature gauge can be pretty useful especially as the vehicle ages and the radiator loses efficiency. It is also nice to have a peace of mind when climbing a mountain-grade on a hot day. Since this Volvo is going to spend a good part of its life climbing Coastal Mountains, we added an aftermarket digital gauge package similar to the one we added to the SHO. This supplies engine temperature and boost gauges. If you are not into serious off-road use, the XC gives you the interior space of smaller SUV’s without the taller centre of gravity and extra fuel use. The XC is not an inexpensive car but with its content and technology, it offers good value. It is one of the few wagons left capable of towing larger, albeit aerodynamic trailers. Mercedes, BMW and Cadillac are the other manufacturers. Though the Caddy is a similar price, the BMW and Mercedes are considerably more expensive.